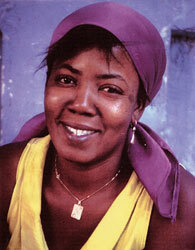 Born in 1968 in Port-au-Prince, Haiti, Constant is married and the mother of four children. She has been making flags since about 1990. Constant is the acknowleged leader of the new style of vodou flag artists, creating ornate and incredibly densely beaded flags, often much larger (some as large as six by seven feet!) than traditional flags. The flags are much more painterly than traditional flags, often showing side views ofm figures and even employing perspective. Though they depict the classic subjects of vodou flags, namely the lwas, they are often used and collected purely as art pieces. Constant learned the craft from her mother, who worked in a Port-au-Prince factory making beaded weding dresses. A number of women flag artists, including the late Amina Simeon, learned their craft at this wedding dress factory, which closed in 1998. (Biographical info adapted from the late Marilyn Houlberg's notes to show at Tap Tap Restaurant). Myrlande Constant was recently (April 2011) featured in a major exhibit of Haitian Art at Brown University, entitled Reframing Haiti: Art, History and Performativity. As a guest artist Constant demonstrated her beading technique and engaged in a public discussiion with Wesleyan University anthropologist and poet Gina Athena Ulysse, who wrote an essay about Constant entitled Constant: Haiti's Fiercest Flag Bearer for the Huffington Post.